I worked on this for about six weeks. It took a few weeks to narrow my choices down to the top 50, another session or two to develop a rough ranking, and then at least ten sessions of Photoshop work where I reevaluated all of my choices. I’m likely to make at least one or to more changes in the course of getting all the posts up. The noir countdown generated more than 200,000 hits, so I want to make sure I do my level best — all of those “commercial artists” (ouch!) who worked in anonymity deserve it. These images are all fairly hi-res, so feel free to download as many as you like — they make a marvelous fodder for screen-savers. I have much larger print quality files than those posted here. If you’d like a set get in touch with me and we’ll figure something out. 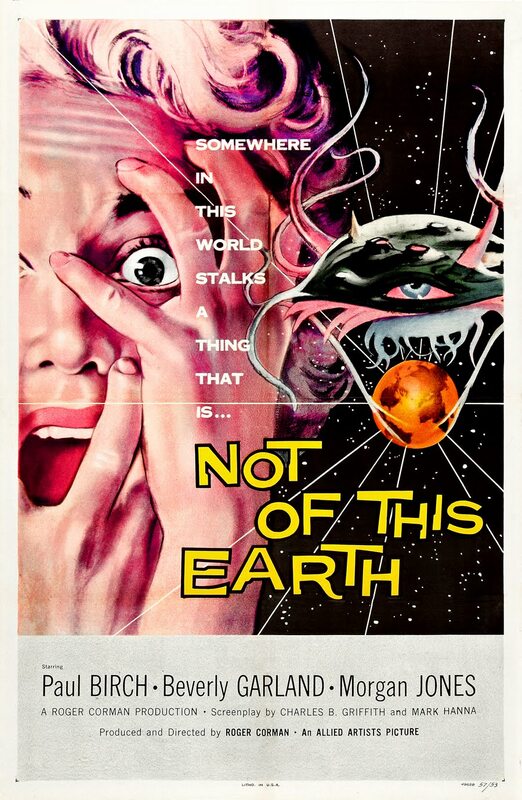 This is not a ranking of science fiction movies themselves, but the posters that marketed them. In the real world I’m a university graphic design professor (as well as chair of the department of art and art history here at my school) and longtime professional designer. My designs have appeared in what designers refer to as “the annuals,” (like Print, How, and Graphis) more than 300 times. So while all of the choices shown here are subjective, there’s some small measure of heft behind my opinion. 1. Only films from 1940 –1960. 2. Only American issue posters of American films — no European versions: apples to apples, not apples to oranges. 4. No re-release, reprints, or retrospective posters allowed. 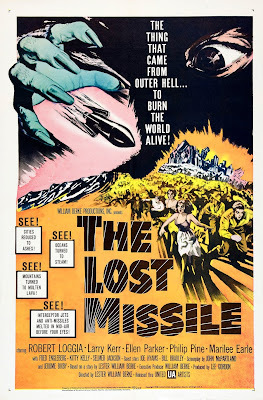 Only original, first-run, theatrical release posters. 1. Design / Artistic merit. Composition, color, balance, typography, use of illustration / photography, graphic power, etc. 2. Execution of Imagery. A new parameter for the Sci-Fi countdown because so many of the posters are illustrated. The trick is how well? 3. Concept. How well does the poster communicate the film’s message? Is the poster authentic? Is it misleading? Does it reach the intended audience? 4. Originality / Novelty. I reward artistic risk-takers! 5. The Blank Slate rule. All films are equal, from prestige production to Poverty Row. In all likelihood, many readers will not have heard of all films on the list, and many will be seeing the posters for the first time. That should be half the fun. 6. My personal taste … is the least significant of the criteria. My choices are guided primarily by the above, but it would absurd to imagine my personal likes and dislikes didn’t play some part in my choices. However I’m not hiding behind opinion: this is not a list of my favorites. This is an empirical ranking of what I consider to be the best, with my likes and dislikes shoved as far to the side as possible. And while any such list is, of course, purely opinion, not all opinions carry equal weight: this one is highly educated, professionally seasoned, and exercised daily! Oh, and I’m a pragmatist to boot! 50. 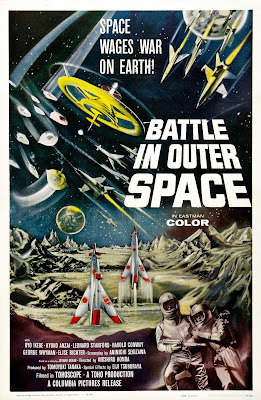 Battle in Outer Space. 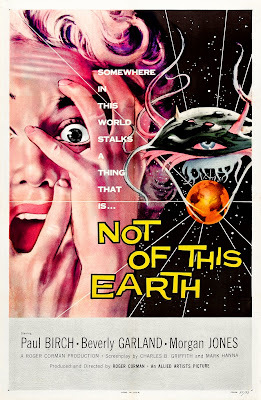 A great film to start with: get a load of everything happening here! We’ve got fighter jets squaring off against spacecraft in a scene reminiscent of Independence Day, a 2001-style space station, a well-rendered moonscape, and a pair of astronauts. The figures in the immediate foreground are striking, and anyone who was with me through the previous countdown knows this poster has two things I like: well-organized typography and well thought out fore-, middle-, and background. The sense of depth coupled with competent rendering makes this all work. Sure, it’s a little busy, but without a movie star or a rampaging beast, spaceman, or robot to showcase, or even a scantily clad girl, the artist did well with what the film provided. It didn’t take long for me to invoke a favored word, one I’ll use from time to time when discussing the posters: designerly. It usually means the image in question has idiosyncrasies that graphic designers in particular will be drawn to. Gamma People is such a poster, here’s why: The color scheme is unusual for a film poster, eschewing bright reds and yellows for turquoise and black — a color scheme oft-employed by contemporary designers. The use of a reversed, or photographic negative image is especially impressive as well, as is the substantial sense of pictorial depth the designer has created, solely through the scale of the marching “gamma people.” The waves emanating from the transmitter in the upper left corner are also an asset — we’ll see such waves again and again. They look good (they pop! ), and also successfully tie together the disparate compositional elements in the design, as well as reinforcing the sense of depth by going “behind” the marching characters and pushing them forward. The typography here is nothing special, and I’m a little disappointed to see the film’s stars at the bottom. Nether Douglas or Bartok was ever such a star that I would acquiesce to their getting in the way of such a great design. This could have gone higher, but I’m comfortable with it here. 48. It Conquered the World. See what I was saying about those waves? Here they are again. Roger Corman gives us a frightening creature here, the first of many on the way in the next few weeks. The same is true of the horrified woman in the foreground — we will see her time and again in the countdown, in many different guises and states of wakefulness. 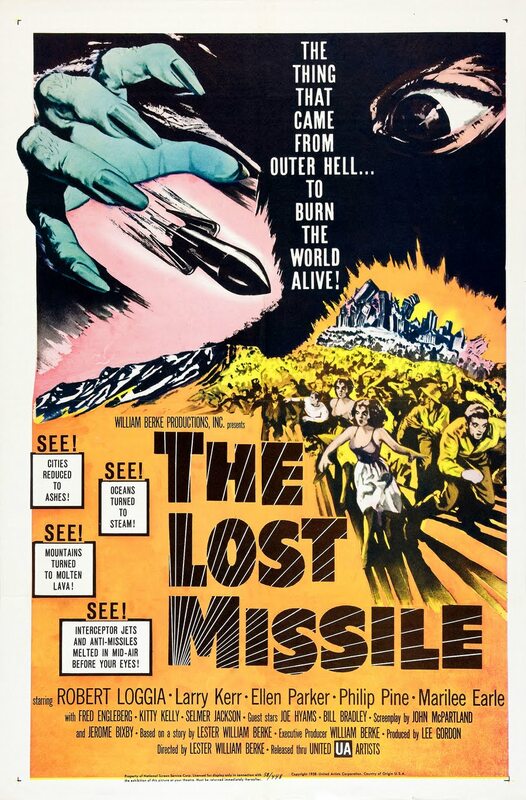 Fantastic creatures and damsels in distress are a few of the most popular poster tropes in classic science fiction. There are many others, and we’ll see them all in abundance before we reach #1: tanks and soldiers, people fleeing catastrophe, SEE! boxes, dinosaurs, buildings tumblings, and so forth. While one could argue that this genre in particular is populated with somewhat derivative posters, I’d argue that while we’ll see a few robots holding passed-out young women, the posters are all done with such expert skill and passion that they never feel like knock-offs of one another. 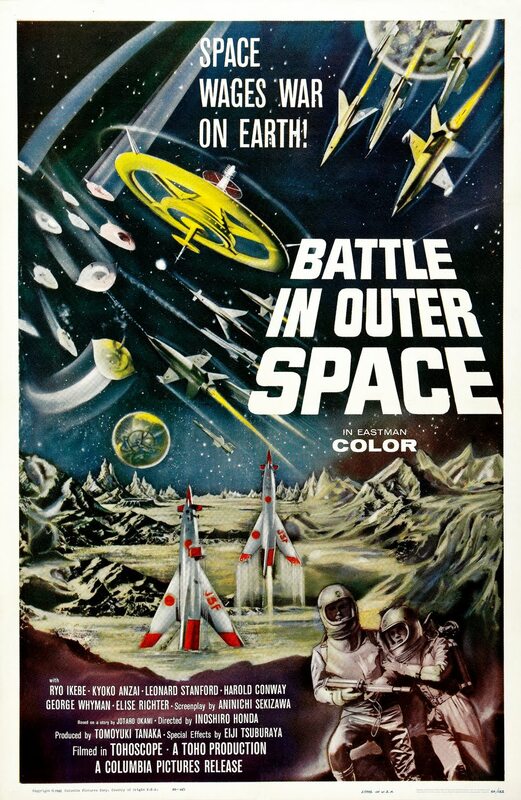 Instead, vintage science fiction posters often capture extraordinary prices at auction, just as the films they represent have captured audiences for decades. Not much to note here beyond agreement with Pentagram partner Paula Scher: “Make it bigger.” This is a poster, just like the film, that benefits from making it bigger. Super-gigantic typography married to an equally huge image. The babes in the foreground and the jets in the background really give a powerful sense of scale to the type and image, while the stylish black tagline and the vibrant red background give this plenty of punch. 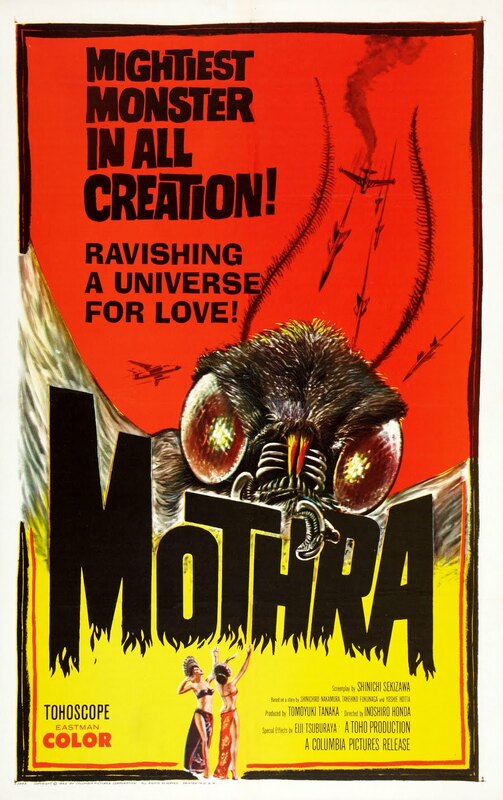 The flames at the bottom of the title typography are a nice detail, as is the beautifully elegant rendering of Mothra’s antennae! There were many dinosaur films produced in the fifties, yet most of the posters don’t cut the mustard. This is one of the better ones, wholly on the strength of Ken Sawyer’s excellent painting. 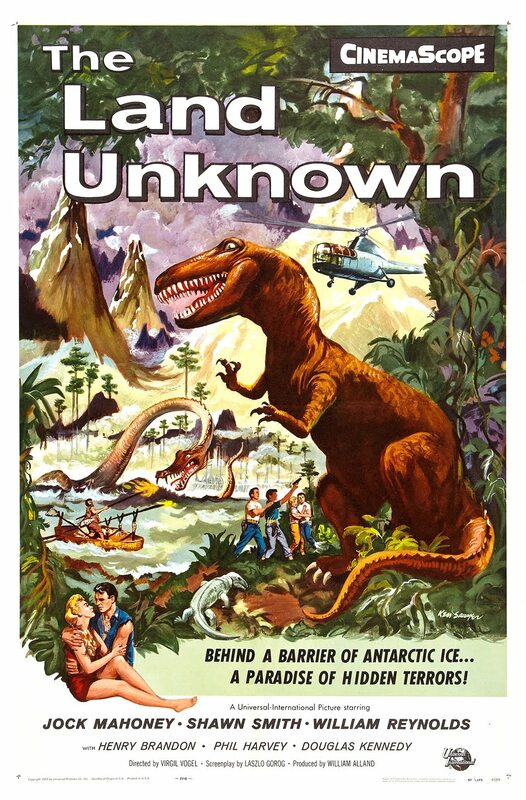 I’m not buying the relationship of the T-Rex to the group of people standing at its feet, but there’s so much detail otherwise, especially in the “unimportant” areas of the composition, to make this poster a success. The couple in the foreground can take a flying leap as far as I’m concerned (you gotta let ‘em know there’s romance) — but the sea monster and the mountains in the background are positively Tolkien-esque. And how about that whirlybird? Hopefully I won’t be giving too much away if I acknowledge that the poster for Forbidden Planet is still a few weeks away? 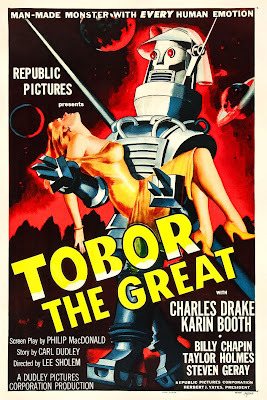 At that time I’ll offer a more complete comparison of that poster to this one, but for now I think it’s important to point out that Tobor the Great is the earlier film by two years, and consequently can make a claim to having the original image. Yet it falls much further back in the countdown because, in spite of what’s become an iconic image in the annals of science fiction, the poster here just isn’t as well designed. The typography is carelessly arranged — shoved and crowded into the corners of the poster, with the title type covering up important parts of the central image. Audiences wanted to see the robot, not the type! Let’s design a poster that can gracefully show both. Two more quick notes: what is that diagonal slash that divides the poster in two? Surely it doesn’t need to be there. And finally, take a close look at the body angles of the robot and the girl: Tobor is seen in a three-quarters view, while the girl appears in profile. For this to hold water, she would have to be a cardboard cutout. An iconic poster, but crudely rendered. 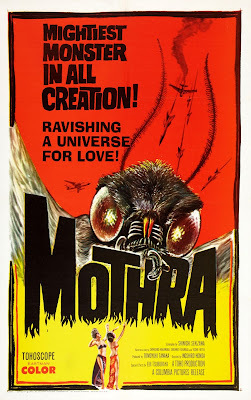 Here’s another poster with a creature holding an unconscious girl — I told you there would be plenty of them, just wait! Yet in this poster the relationship of the two figures is much more believable. We also have tanks and army men with guns trained on the invaders, as well as a terrified group of people running away from certain destruction. 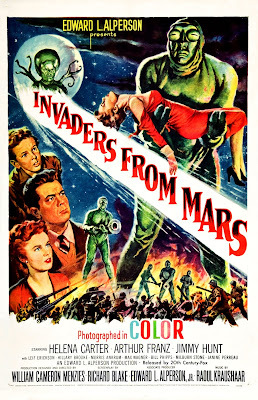 While this is a well-composed and skillfully rendered poster, it’s impossible to escape the feeling that the titular invaders are nothing more than actors in tossed-together get ups — and it hurts the overall impact of the poster. This is particularly surprising considering the film was directed by famed production designer William Cameron Menzies. The overall feel of the film is surreal and beautiful, but the 'martians' themselves leave a lot to be desired. In this instance I would have encouraged the artist to be a little more creative in trying to hide the cheapness of the film’s costume design — even if some measure of artistic license could have been taken. I’d also seek some improvement in the title typography, which is stacked and difficult to read; it even gets lost amidst the colorful artwork around it. To its credit, and as opposed to the Tobor poster, the text typography, or “fine print,” is deftly handled. Nonetheless, I’d happily hang this one on my wall. 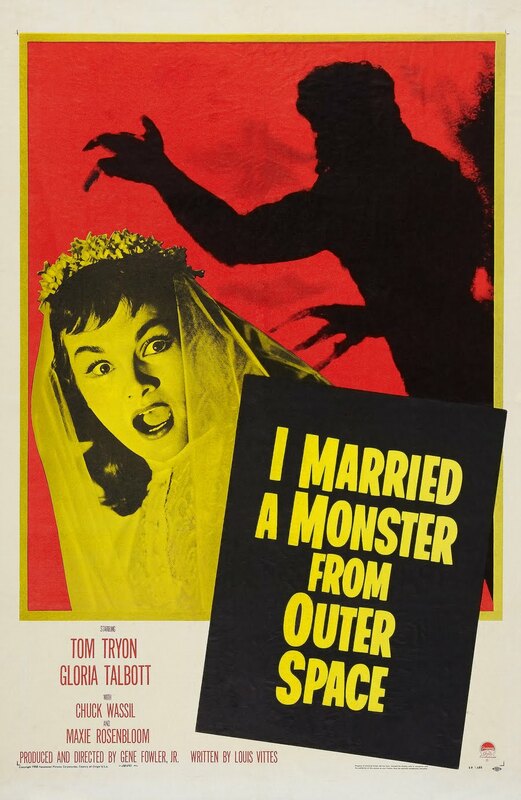 This is the first poster I struggled to place, another gem from Roger Corman. I’m not very happy with the color scheme or the overall graphic impact of the design, but I appreciate the simple image-type-image horizontal arrangement and the clever way the tagline is stacked into the composition. However my primary reason for including the poster in the countdown is the use of the extreme close-up of the female character’s face — which more than almost any other poster in the countdown, anticipates the design tropes of later decades — though if for better or worse I’m not certain. This poster could have been improved by eliminating the gray text box at the bottom and extending the artwork through the entire image area. There would have been plenty of room at the lower right to easily include such a small amount of text type. Hooray for SEE! boxes. 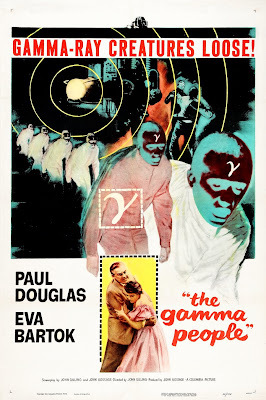 This odd poster is the first to have them, and while they aren’t very well organized in this example (they come at the expense of title typography that is too small to be so busy), such boxes are one of the campiest and best-known aspects of science fiction posters. This is such an offbeat poster though — more suggestive of Luis Buñuel than Lester Berke, with its surreal disembodied eye and colossal hand. All of the elements in the composition seem cobbled together in a way that brings to mind the use of clip-art — get a load of those buildings in the background — but the overall effect is unsettling, and ultimately pleasing. This might improve if the SEE! boxes could be nixed and title was scaled to encompass the entire bottom of the poster. However upon reading the content of the boxes it becomes clear how necessary the producers felt they were to properly sell the picture. If you haven’t seen this, I suggest you do so — in spite of a title that drips camp, the movie itself is surprising and universally exceeds viewer expectations. The poster hits a home run for simplicity. Red, yellow, and black are oft-utilized colors in poster design from this or any genre, and this is a good example of why such colors work: when juxtaposed correctly they create a lot of graphic zing— making a poster stand out on a crowded wall. 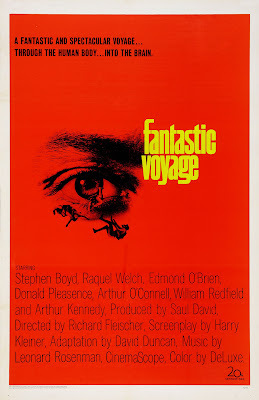 Don’t forget the value of a poster that tells a story, giving viewers enticing hints about the narrative Even though this design uses just a few simple images and, for once, no tagline, it provides plenty of information about what we can expect if we buy a ticket. I also appreciate that the aliens are merely suggested, leaving something to the imagination and making them all the more frightening because of it. The designer of the poster for Invaders from Mars would benefit from viewing this one. Back next Tuesday with ten more!